« Iceland : The south bits. This recipe was inspired by one of my random Skype conversations with my girlfriend Kerry. She was pondering what to cook for dinner one evening and she said she was fresh out of ideas. Her boyfriend had been away for a week and she wanted to cook something a little special for their evening meal on the day he returned. I had suggested pan-fried chicken breasts stuffed with herb + garlic butter for the main. We were a bit stumped with the salad bit until she mentioned he liked chickpeas. It was then that a vision flashed before my eyes and the beet & chickpea salad was finally decided upon. 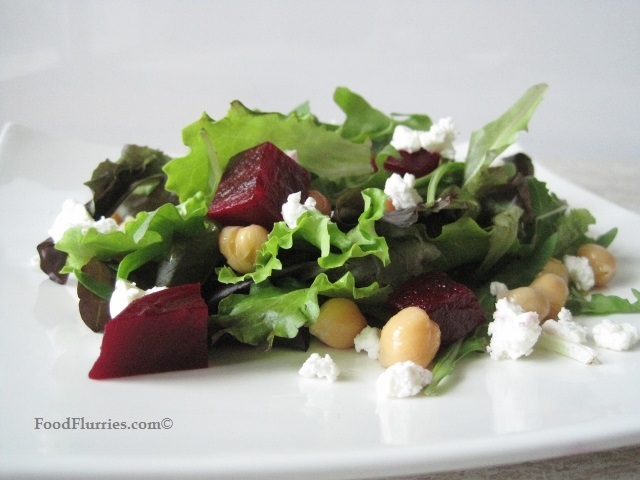 I know this salad is no novelty, and it has probably been done a million and one ways, but this is the first beet recipe I am featuring on my blog this summer. The shops are positively overflowing with beets this season. Such a vibrant little root vegetable, it’s garnet flesh almost mesmerizingly too beautiful to eat. I just want to stare at it like a jewel in my salad. And that’s just the thing isn’t it? It almost blings up a salad and raises it up a notch; deep red burgundy cubes nestled amongst the crispy green leaves. And as we ~ (by WE I mean me) ~ have learnt from the Iceland trip that sweet root veggies go well with salty accompaniments, so I am crumbling soft feta on the top. For some textural contrast I then add the chickpeas. This is a simple salad that can be put together in a matter of minutes. 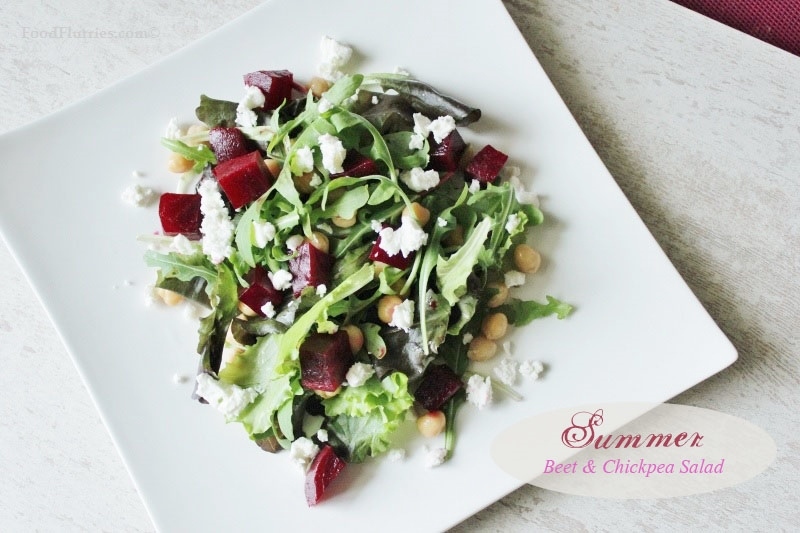 Nothing needs to be cooked or fussily prepared; just simple flavours coming together in a delicious summer salad. Drizzle a hint of olive oil or vinaigrette of your choice and you are good to go. Wash and dry the leaves thoroughly. Then cube the beets, keeping them roughly the same size. For sweeter beets you can always roast them in the oven for 20 mins. Drain the chickpeas and toss them through the salad. Plate them then arrange the beets in and around. I wouldn’t toss the beets with the salad, personally, coz I don’t want everything turning a vivid plum. Drizzle over some olive oil + a tiny sprinkling of salt. Then crumble the goat cheese and voila! Your salad is done. If you’d like this salad to accompany some form of protein then I think roasted chicken Marylands (the cut, not the dish) with a spiced dry rub would go beautifully. Cummin, coriander, paprika, bit of oregano … mmm … the list goes on. My mistake was not actually including that chicken dish here in this post. Epic fail. Anyway, do try this salad even if you don’t think you’d be in to beets …. you just might surprise yourself. However, R. has already declared he isn’t going anywhere near the beets. But so what, he doesn’t go near salads anyway. In my house, if I am going to be making salads, one of two things need to be happening: a) I gotta be in a salady mood, and be prepared to eat all of it solo, and b) We need to be entertaining people at our table. Anyway, enough rambling …. 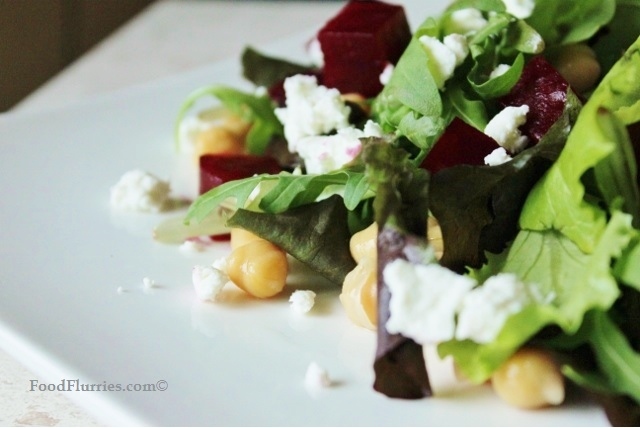 make the salad and fill your tummy with vibrant goodness. Until next time then.